Right now, the Meister family lies scattered across the world thanks to our jobs. My younger brother, an Army company commander, lives in South Korea, while my younger sister, an Air Force Captain, resides in Texas. My dad lives here in northeast Ohio, while my mother routinely travels back and forth between all the houses to take care of things while the other two are off on tours of duty. We haven’t been together in the same room as a family since the early summer of 2001, so it was decided earlier this year to get everyone together in one part of the globe for the first time in six years. Our family vacation started early on a Thursday morning a few weeks ago. My dad and I left from Cleveland, Ohio to meet up with the rest of the family in Honolulu, Hawaii for a week-long vacation. The plane trip consisted of two flights lasting four hours from Cleveland to Phoenix, Arizona, and then another seven hours from Phoenix to Honolulu. We arrived in Hawaii around Hawaii around 2pm local time thanks to a full six hour time difference from Cleveland, where it was already 8pm. My brother was already at the airport to greet us, having arrived from South Korea a few hours earlier. 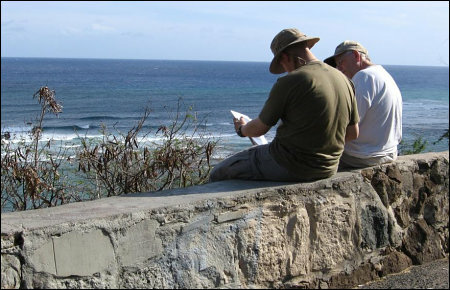 We still had a couple of hours before my sister and mother arrived, so we took a short trip up to the roadside cliffs looking out over the beaches near the Diamond Head crater. The wind was pleasant, while the temperature was warm, but not overbearingly so. Eventually, we headed back to the airport, just as it was finally starting to sink in that, yes, we really were in Hawaii. Everywhere you looked, people were in shorts, walking down streets filled with palm trees and tropical flowers. I was especially surprised at how even the most ordinary parts of town seemed to be filled with color from what I considered exotic plants. Yet, I still had to keep in mind that for the citizens of Honolulu, this was simply another average day at “home”. Our first day in Hawaii ended relatively early, with most of our time spent walking up and down the world-famous Waikiki beach. 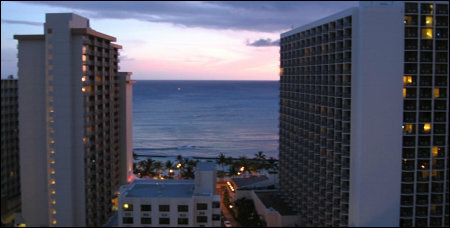 Our hotel, despite being a few blocks away away from the beach, still offered a great view of the ocean. All in all, it was a pretty good start for the week.